"During November"? The next anniversary pet, maybe? This pet has been added in Legion, summoned by Odd Murloc Egg. It will likely be a Blizzcon 2016 pet. This pet is based on Squirky (a Level 1 NPC in Ironforge) that has been in-game since patch 4.1.0 (Cataclysm). He stands next to Grimnur Stonebrand, who grants the quest Fish fer Squrky - one of the Ironforge Fishing Dailies from Cataclysm. EU Burning Crusade Collector's Edition Promotion - Granted in addition to Netherwhelp's Collar as compensation for an in-game pet delivery system that didn't work. Looted in-game from White Murloc Egg, in a cave in Borean Tundra with an underwater entrance at . Grants the Feat of Strength The Marine Marine. Grants the Feat of Strength Deathy. Grants the Feat of Strength Murkablo. Any pet that sees fish as both a delicious food source and a perfectly acceptable weapon of war has my approval. Guys, you're forgetting about something else Blizzard is doing in November. Pay close attention to the flavor text. During November, a secretive clan of murlocs often sends young tadpoles out to explore, adventure, and begin their tale. This is a young murloc, the story is about a child. Now, maybe it will be an in-game acquired item, or maybe a code will come with the book. Either way, it looks pretty likely its a tie-in with it. Food for thought, maybe the answer of how to get him is in the book? Added: I also think its awesome we have another in-game murloc, please Blizz, more murloc pets in-game. Well, boooo, Nov is gone and he wasn't yet discovered, but over on WCP there's a comment from a GM saying shouldn't be looking just yet. Its 4/5/2017, March of the Tadpoles, time to find out if that is the source. Let's hope, been waiting for him for so long. I suspect this guy will be found somewhere around Seabreak Isle off the coast of Aszuna (in the Great Sea) during the month of November. Update: They changed the description from "during November" to "During a special time of year, a secretive clan of murlocs often sends young tadpoles out to explore, adventure, and begin their tale." Maybe we'll get it for the Blizzard anniversary gift? Please tell me all hope is not lost! Now that it's the first November in legion maybe we should launch and investigation into getting this pet and have to consider that it may not be a promotional pet. Here's a reddit thread for those who have any other additional info https://www.reddit.com/r/wow/comments/5ajsvt/me_and_a_friend_have_been_investigating_how_to/ we've found a few things which may relate to getting this pet. It may be related to Seabreak Isle off the coast of Azsuna which contains yellow murlocs - why? - There are eggs you can hover over but not use, named "Pristine Squigglefin Egg"
I just received my Blizzcon 2016 goodiebag. There was an ad (which was sealed by the way) for the Travlers books. The text has changed: now, it no longer mentions 'November'. Instead, it says, quote, "During a special time of year." The anniversary is coming up on November 16th. I strongly suspect that this 'special time of year' is the anniversary. Which is *also* in November. So, Kosumoth the Hungerer, and the Long-Forgotten Hyppogryph both had pretty interesting acquisitions. I'm wondering if this does too. Possibly related to the Murky quests/achievements, maybe defeating the Captive from Stern-Fathom's pet Journal in a Family Familiar style. Either Bliz hasn't unlocked this activity yet, or we're missing something. So 12th Anniversary started today (TW realm reach 16th Nov earlier) and I visited Seabreak Isle. Nothing changed as of now. Bought and used the murloc appearance does not turn the npc on the Isle into yellow or interactable. The eggs are still not interacting. "During a special time of year, a secretive clan of murlocs often sends young tadpoles out to explore, adventure, and begin their tale." Before they changed it, it said November. In november we have Pilgrims Bounty. Maybe Squirky will show up then! Why then you think? What defines a pilgrim? 2.A traveler or wanderer, especially in a foreign place. This made me think it might show up during Pilgrims Bounty. This is almost certainly a reward from the March of the Tadpoles mini-holiday. I think I solved this mystery just now! GMs stated that this pet is still unavailable. Sure, that's because it will be available on April 5 - March of the Tadpoles micro-holiday event (https://worldofwarcraft.com/en-gb/news/20407403). During a special time of year, a secretive clan of murlocs often sends young tadpoles out to explore, adventure, and begin their tale. I wonder if it's related to getting this pet? Now that November and the anniversary event has come and gone, there's only one other explanation I can think of. Perhaps this little guy is actually part of children's week. We've taken dozens of hundreds of thousands of children on adventures during that special time of year. Maybe now it's finally time we met a companion that seeks it's own adventure. "Squirky is not yet available, you'll know it when it happens!" did anyone check the seabreak isle during the march of the tadpoles? There you can find yellow murlocs named Squigglefin(+murky = Squirky), you can also find murlocs torturing a human for unknown reasons, three caged animals (a small tuskarr named nanook, a penguin named slushy, and a deepsea murloc named spurt) and a yellow murloc is constantly casting lightning spells on them. The whole Island is also full of skeletons. in the middle of the island there are three skeletons sitting together, they look like they are from monkeys because of the pose. On top of the isle there are two little skeletons holding hands, they resemble gnomes. One of them is holding a gun while the other is wearing a necklace (makes you think they were killed for trying to steal some of the treasure). There are lots of blue murloc eggs near the murloc leader and there are baby toys near them (the item that teaches squirky is called Odd Murloc Egg and it's thumbnail is a blue egg). The leader squigglefin Crablord is guarding stolen treasure and there you can find lots of gold, pandaren brew kegs, a small golden statue of emperor shaohao, an inflatable floating pony, a weapon with the appearance of the Amber Spear of Klaxxi'vess (Klaxxi polearm), a bubbling purple potion vial, some wooden objects, a klaxxi insignia and a HUGE pearl. Most of the treasure is somehow related to pandaria, maybe even the pearl which can be from that huge oyster located northwest of dreadwastes called Gokk'lok (It is the only huge oyster I know of in the game and if you kill it you get to keep the shell for yourself, but the pearl ends up with Chief Rikkitun, leader of the little blue sprites). I don't know if Squirky is one of those secret items which take a lot of people to find out how to get, or even if it is related to this Island. But this last bit of information made me think... what if these murlocs migrate to pandaria once a year (during a special time of the year) for some reason and they stole the pearl from Chief Rikkitun? or how did all that pandaren treasure got there? also, what "special" time of the year is it talking about ? I might be completely wrong, but it's fun to speculate, if someone has any additional information about this, I'd be happy to hear. Happy Squirky Day! Squirky the yellow murloc is now live on the gear store AND available in-game on Seabreak Isle! We’ve added a new member to the murloc family. Meet Squirky! This cuddly bit of sunshine will mrgrrgrgllll straight into your heart, both as a cuddly plush and as an in-game pet you can capture and take along on your adventures. Purchase your Squirky plush today! Flew out to Seabreak Isle shortly after the announcement that this guy was now available. It's a wild pet battle on the island with all the elite murlocs, so bring friends or a character capable of withstanding the mulocalypse, as each one has 8.3 million health and you'll need to clear a few to get your Squirky. You might want to bring a hunter or rogue that can CC and quickly drop combat and try to catch one of these battle pets, or fight your way through lots of 6-8 million HP Humanoid mobs that run around like crazy. There are tons of Squirkys to catch a few minutes after the announcement, but the place is totally covered with elite mobs. Since there were so many, I caught three to check the breed and they all seemed to be the same breed every time and always grey quality Humanoid pet for me. Just got mine today off the coast of Aszuna on Seabreek Isle, closest flight point IMO is Challiane's Terrace on the Blizzard Map it shows up but if using Carbonite it is not visible. I found the island with about 10 battle pet Squirky's on them but also crawling with Squigglefin murlocs the inhabitants of the island. The worst mob I encountered was the Crablord who I did not successfully kill. My strat was to kind of sneak in grab my battle pet and run like heck. I took out on single shot one at a time till I had a running head start and waiting for the Crablord patrol to pass the ran in and started the pet battle. 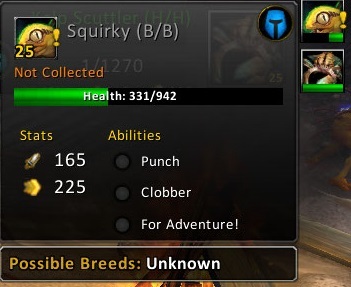 The Squirky I battled only had 1144 health so it was hard to get him down low enough to capture, so you might want to bring a low hitting/striking battle pet around level 20 that can take him down about 300 hit points at a time. The other two pets that showed up to kill was a crab and spider. Good Luck to everyone that was a really fun fight to get to the four pets in the center of the compound. 1) He is available as of today - 5/23/17. 2) You do NOT need to purchase the Plushie to obtain him. 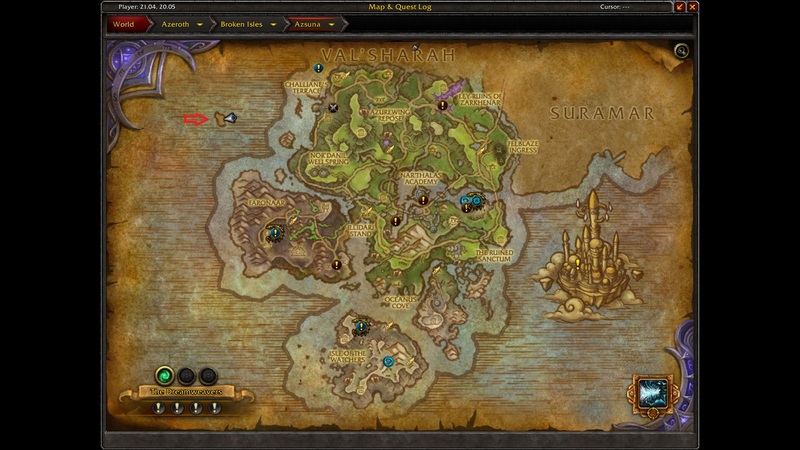 3) Fly out to the island on the map shown here - there will be plenty of Squirky to catch. 4) You MAY want to bring a friend - there are 110 Elite Murlocs on the island, and it's easy to get swarmed - They are fairly tough (about 6-8 million HP each), constantly attack with a Waterbolt spell and also cast Heal on either themselves or another target (Note: interrupting one does not cancel out the school for the other!) - they don't seem to have a fast respawn, fortunately. My advice is to use some clever tricks to fly down and quickly get into battle - works best if you can stealth/camouflage and then initiate the pet battle. Be careful when you leave though - you may be swarmed by 10~ Elite Murlocs. > NOTE: At the moment, it seems the Squirky are not affected by AoE damage, but be careful nonetheless! Starting a pet battle while in stealth is an easy way to avoid aggroing the elites, especially since (as of this post) ending the pet battle doesn't break stealth. They all seem to only be anvailable in grey Quality at the moment. I battled multiple Squirkies and they had the same grey Quality and Breed. I only have one question: Since the description of Squirky says that ''During a special time of the year'' they send out the squirkys, does it mean this pet will be only available for a limited time? Squirky is finally here. Yes, you may find him and his little siblings all over Seabreak Isle in the The Great Sea off the northwest coast of Azsuna. But be warned, there are lots of murlocs to clear before you'll be able to fight the little guy. My best advice is to use single targeting and avoid AOE attacks otherwise you'll pull in a bunch of seagulls on top of everything else and get the "You're in combat" warning when you try to start up the pet battle. That's one high-quality murloc model! Kind of wish Murky and the "generic" tadpoles were updated, too. Squirky is a tameable battle pet via pet battle on Seabreak Isle, which is a tiny little island just west of Azsuna. If you have flying, you are able to fly over this island. In spite of the high demand for these little guys, there are enough for everyone. Aside from the 110 Elite mobs, there is a large mob group (Murloc Gang) that runs around the middle and lower half of the island - this can be deadly if you come out of a pet battle to be surprised by their not so friendly welcoming. Fortunately, there is a graveyard right on the island. I found the best place to catch these little guys is the upper area of the island around coords: 19.0, 19.0. If you get this upper area cleared out, it is not one of the areas where the large mob group wanders (Murloc Gang) - once it's cleared, you can easily catch 2 or 3 Squirkies before mobs respawn. Squirky seems to fight with critter and or aquatic pets, he is humanoid himself. I used my Terrible Turnip, Ghostwolf Pup and Cursed Birman (Spirit Claws & Devour). Provides bonus pet heals and the undead are great against humanoid, while the Cursed Birman has great attacks against critters. I noticed that Squirky does not come with any specialty abilities such as P/S, S/S, etc. Therefore, it doesn't matter which one you get - upgrade it with a Flawless-Battle Stone. It will save you on repairs and give others a chance to pop in and get theirs before the mobs respawn as well. *Squirky is cool, but nowhere near as adorable as Terky, Terky". **Thanks Blizz for adding another in-game attainable Murloc pet! *Squirky is cool, but nowhere near as adorable as Terky. FYI if you don't read the sidebar, he is not cage-able at all, so don't go out there with the intention to cage him and sell him. They are now out for capture. If you don't have flying yet, don't worry. Swimming will get you there, too. Best flight path would be Challiance's Terrace. Fight wise there is nothing special with this mob cause its just like any other pet out in the wilds it can be common all the way to rare and there is plenty of them around so if you dont snag a rare one on your first try there is plenty more around to farm a rare. "Looking to add to your in-game pet collection? Be prepared to face dangers untold just off the coast of Azsuna on Seabreak Isle. These elite members of the Squigglefin tribe aren’t going to be happy about your visit to their little home, but if you’re lucky, you’ll be able to find Squirky among them. Summon your veteran pet battle team into action, and make him a part of your own band of merry battle pets." The easiest place I found for farming is at 19.4, 20.0 or there abouts. There are 4 Squirky's within reach - 2 stationary and 2 running around (see my screenshot). I am an 884 disc priest and had no problem catching them (the ones running around are a little difficult but doable) and I had my rare in no time. The respawn rate for these little guys is fast. I used a team of Anubisath Idol, Scourged Whelping and Harmonious Porcupette, all 25 all rare. The Idol practically defeating all 3 opponent pets (the Porcupette didn't do anything and was just used as a filler). Happy hunting! Terrible Turnip with Weakening Blow can easily cut him down to 1 hp in 4-5 moves without killing him and as Dgnuff suggested, starting out with Sunlight can make this battle even faster. Plus it is available on the AH if you don't have it. Just bring 2 extra pets with Critter damage to wipe up the extras. Other pets with Weakening Blow ability are Mr. Terrible and Snobold Runt As well as any pet with Superbark, one of which is Grumpy, as pointed out by Shadedmon, which you can get easily since Grumpy is located in Val'sharah. As a rogue you can stealth while doing the pet battle. I just captured 3 and never came out of stealth. Not seeing alot of pet strategies or what to use tho, im guessing its not that big of an issue. Either way, this is how I did it. Squirky is a new battle pet murloc that can be found at Seabreak Isle in Azsuna. There are alot of these pets, he's not unique, so no any problem to catch it. The only problem - elite murlocs (8 mil. hp) that may break you if pulled in group. For TomTom or coordinates users, this is a good spot to catch a Squirky as he runs by without pulling one of the elites, enabling you to swoop in and initiate a pet battle. I did pull one of the elites as I exited the pet battle, but it should be easy enough to run away if you don't want to fight. Druid flight form makes this trivial, hover, wait until a pet is a little clear of mobs - dive + right click and pet battle. Be read to click flight form as soon as your pet battle is over as you won't be in flight form but you will have a second to change when it is done. If you're a hunter without flying, you know the drill. 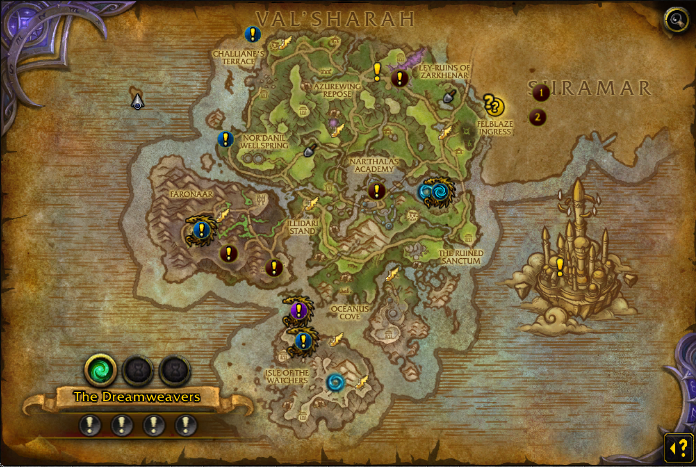 Strider (or swim) to the island (no fatigue), camouflage, walk to the coordinates LiriellGarrosh posted (/way 19.33, 19.09), and capture the pet. If you get attacked, feign death until camo's cd is over. You can start a pet battle if you're camouflaged, or while you're feigning. The respawn rate of these pets are very fast, however they're unkillable outside combat (which is usually not true for other wandering pets). So, if you're looking for a rare and you want them to die just so another can spawn, I suggest using a Frostwolf Ghostpup with Ghostly Bite. This will one-shot every low and common quality Squirky you find. After you kill it, just forfeit the battle and Squirky will despawn. I do not suggest however that you farm for a rare. Unless you're very lucky, it seems that the rare version is actually rare. Murlocs have a lot of HP and spawn constantly, which you'll have to deal in order to combat the pets in the island. I suggest that you just capture any Squirky, since they only have one breed and use a Marked Flawless Battle-Stone (you can buy one from most battle-pet vendors for x15 Shiny Pet Charm or even as WQ rewards) or even a Flawless Humanoid Battle-Stone. Save yourself some trouble and time. A red arrow points to my spot if the upload goes through. Flying is pretty essential for this one, as many of the great tips given here about where to go to avoid the mobs involve you basically dropping in from above. However, if like me, you can't fly yet, there is another option: come on in on the left-hand side of the shipwreck at 20, 22 (the southeast tip of the island); there is one right on the front side of the shipwreck. If you time it right (there's a wanderer chasing a seagull that comes in round the bottom of the island, from the left/west), you can get in this little crevice where the ribs of the ship bury in the sand, right on the waterline on the left side, & that pet is within range AND - somewhat surprisingly - you won't get the "Pet battle area obstructed" message. There's a very exact spot you can fly to: 19.37 20.12 that will be just out of aggro range for most things around you. Fly precisely to this spot, and then drop straight down (Move Down Key) to battle. You'll be able to battle 2 different Squirkies from that spot (one under the mounted conch shell and one on a little platform around the corner) . I would drop down, battle, mount and fly up straight to reset pets, then drop down again and battle the 2nd one. If you're really fast at battles and need a third battle before the other two respawn, there's a third Squriky that runs by that looks to be battle-able if you need it (I never needed it because the respawn rates are so fast). I never just stayed on the ground between battles but after about 20 battles, I was never attacked leaving a battle when in this spot if I flew up immediately. However, one time I stayed too long on the ground and was attacked. You can run down the dirt slope and swim away if you don't want to engage. Another trick you can do to make sure you don't take aggro: stay on your mount a few seconds when you get to the ground. If something starts attacking, just rise back up a few hundred feet to drop the aggro. I don't know if anyone has posted about this, but I managed to find a spot where the mobs don't see you right away and I was able to capture Squirky. But, in attempting to find a good spot, I was able to start a fight 3 times and, unlike most other areas in Azeroth where mobs don't see you while you're pet battling, on this island, they DO see you and stop the fight as soon as they spot you. So be careful. this is the perfect example of how not to update a model, went from cute to kill it with fire. I think it's the wall eyes or the teeth cause from the side and back its cute but head on oh dear god. This NPC can be found in Azsuna (8).